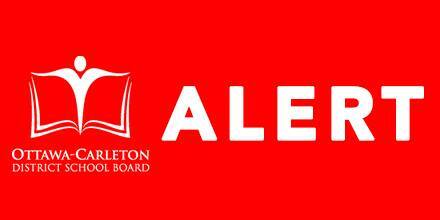 All Ottawa-Carleton District School Board schools, program and administrative buildings including the extended day program and infant/toddler programs will be closed tomorrow, Monday, September 24, 2018. The decision was made in consultation with city emergency services due to extensive power outages and damage to several areas of the city. Ottawa Police have further advised that efforts should be made to reduce the number of people and traffic moving throughout the city due to areas that have been more significantly impacted. The safety of our students, families and staff, is our top priority. Given the significant number of schools that remain without power, and the continued repair work needed in our schools, we feel that this is the best way to ensure student and staff safety. School closures mean there is no before and after school care, and no community use of schools/extracurricular use of schools on Monday, September 24. We anticipate that most schools, programs and buildings will resume regular operations on Tuesday, September 25th. We will provide updates on school openings by 4:00 p.m. daily on our website and social media. Our apologies for any inconvenience.